You don’t need to worry about buying gifts any longer, just make these Christmas Meltaway Cookies for your family and friends. So easy to make with very simple ingredients. These cookies make fantastic edible gifts that both kids and adults love. These meltaway cookies already look cute with their itsy bitsy size, but you can make them look even fancier with some colorful sprinkles. Normally I coat these cookies with powdered sugar, but I wanted to make something different to give it a holiday feeling. Did I tell you before how much I love these lovely guys? They can easily put you in a party mood, can’t they? Just like our Chocolate-dipped Marshmallows with sprinkles. They are always a hit and they make great gifts too. You might want to check them out if you don’t feel like baking something. They are much easier than these cookies. No baking and no cookie dough definitely shorten the time. These Christmas Meltaway Cookies make the best holiday gift ever. It is very easy to make these. Way easier than going to a shopping mall and looking for the perfect gift for your beloved ones. They are ready in less than 30 minutes. Pack them in jars or fancy looking mini boxes and give whoever you like. The best thing about these Christmas Meltaway Cookies is that the ingredients make about 6 dozens. So you can give them to as many people as you like. We need 7 ingredients for this super simple recipe. These are butter, powdered sugar, lemon zest(optional), salt, cornstarch, all purpose flour, colored sugar or sprinkles. I’ve made this recipe a zillion times, trying different measurements or adding various flavors. Here is what I’ve learnt: You can’t go wrong with this recipe as long as you keep the following 4 ingredients; butter, powdered sugar, cornstarch and flour. Use these as your main ingredients and optionally spice them with ginger, cinnamon, pumpkin spice, vanilla, lavender, cocoa powder or any other ingredient that goes well in cookies and create your own version. On the other hand, I use lemon zest in this recipe because lemon or orange zest gives them a nice fresh flavor. These are adaptable for your taste as you see. First; cream butter, powdered sugar and salt. If you use lemon zest, whisk it together with these. Second; in a medium bowl, whisk together all purpose flour and cornstarch. Pour it into the wet mixture and combine well using your hand. Third, make tiny balls and place them on a parchment paper lined baking sheet. Bake in preheated oven for 8-10 minutes and let them sit for 10 minutes on the baking sheet after removing from oven. Meanwhile you can sprinkle colored sugar or sprinkles over the baked cookies when they are still warm. Besides the ingredients listed above, add one teaspoon freshly squeezed lemon and enjoy that lemony flavor in these little guys. If you are a big fan of lemon flavor, you can even increase the amount of lemon zest. 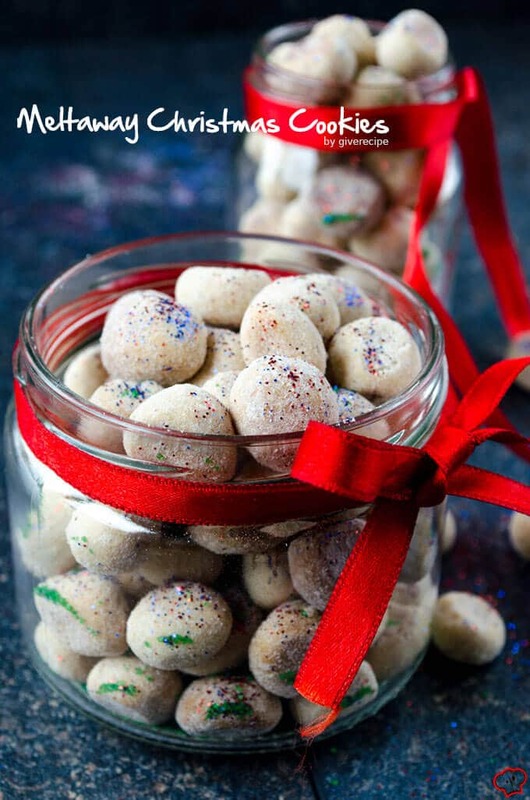 After receiving several questions about how to make sprinkles stick on these meltaway cookies after they are baked, I understood that not all types of sprinkles stick easily. I used colored sugar in this recipe. You can easily make it at home by using Susan’s DIY colored sugar method on her amazing blog The View From Great Island. Mine stick on the cookies. Not as perfect as on a glaze like in our Coconut Snowmen Cookies Recipe, but they are okay. Whisk together two pasteurized egg whites and 1/4 teaspoon water. Let the cookies cool down completely and brush their tops with this mixture and sprinkle the colored sugar or sprinkles over them immediately. If you are after a glaze or frosting, please go check out our Red Velvet Christmas Cookies with cream cheese frosting too. Can You Freeze Meltaway Cookies? Yes, you can freeze these cookies up to 3 months. However, don’t decorate them if you are planning to freeze them. Make your decoration before serving. For this, you will definitely need the egg wash method or a glaze so that the sprinkles stick on these. Also, it is possible to freeze the cookie dough or the cookie balls unbaked. Thaw and then bake. It gets ridiculously easy to bake these cookies then. Well, for me these Christmas Meltaway Cookies are worth the little time and very little effort since they are literally melting in your mouth. Besides, I’m sure you don’t need to go shopping for the ingredients because you already have them in your pantry. 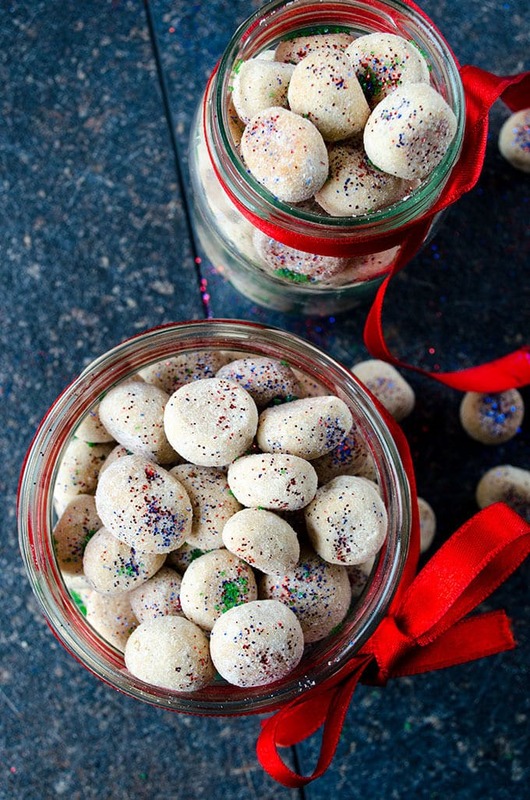 Want more cookie recipes for your cookie swap party? Check out the following links! Originally published in 2014 and updated with additional information in 2018. Can you make different flavors other than plain and lemon? I couldn’t get the sprinkles to stick. I took them from oven to sprinkles. So, I then tried powered sugar and it didn’t stick either.. what am I doing wrong? Someone ask you about sugar which confused me, because the copy of the recipe I am looking at calls for powdered sugar. Then someone else ask about lemon zest and what I am looking at doesn’t mention lemon zest. I planned on giving these for Christmas treats at a party I am having next week, so I am very disappointed. Hi Linda, I’m sorry to hear that. Were the cookies still warm when you tried to coat them with sprinkles? My sprinkles are like colorful granulated sugar and they stick on the warm cookies. Not as perfect as on frosted cookies, but they are okay. The same for powdered sugar. The cookies must be warm. Another thing is that sprinkles don’t stick if you coat them with powdered sugar first. If neither of these works, there is another solution that I need to add in the recipe as a note above. That is, you can use a mixture of pasteurized egg white and a splash of water. Let the cookies cool and brush them with this mixture. Sprinkle colorful sugar or sprinkles over them immediately. I will check the other confusing parts in the recipe immediately and make the necessary corrections. This kind of problems might happen when we change the recipe card we use. Sorry again for your disappointment. I saw someone asked about the amount of lemon zest but lemon zest is not listed in the ingredients? that’s what I get for not reading completely….nm, I see the zest listed as an addition. Making these tonight. In your ingredients it says powder sugar. I didn’t see the in the instructions of when exactly to put the powder sugar. Please help!! As it’s written in the third step, in a large bowl, mix butter and sugar until creamy. And then add in the dry mixture in the bowl gradually. Can they be frozen if made in advance? And, do you think they would ship well? Thank you. Yes Shirley, they freeze well. I think they ship well to as long as you put them in an airtight container. How long do they last in jars? I want to make ahead of time for holidays. Hi Donna! They are good up to one week. No way to skip before finish reading, such a beautiful presentation,i am loving it. Mine totally flattened out, they didn’t hold their round shape in the oven, help! Oh sorry Kaylia! That’s really interesting now as these cookies never flatten. We don’t use baking soda or baking powder, so they don’t normally change their forms. What could be the problem in your case? Could there be a mistake in your measurements? How much lemon zest would you recommend? 1 teaspoon zest works fine. Could I use salted butter? And if so do I skip on adding salt? Well I don’t recommend salted butter because the ones I know here in Turkey are quite salty and it would be too much for the cookies. I mean it is more than the amount of salt I use in these cookies. What type of sprinkles are those???? They look like real glitter in their shape and texture. Where can we purchase them? I don’t know if these have a special name. I’m just in love with the colors! I bought them from a small shop in my hometown in Turkey. I don’t know if you can find them at online shopping websites, sorry. As tiny as the marbles kids play, which are 1/2 inch or 1 inch.